I recently attended one of the yearly Oakland International High School (OIHS) Community Walks and enjoyed seeing the growth of the school, the focus on success by the high schoolers and the enthusiasm of the parents learning English at the ACE Parent Center. 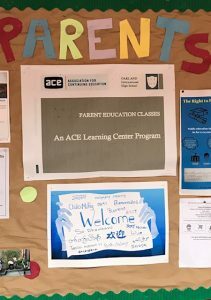 While ACE is only a part of what the school does, OIHS thinks big about providing quality education for recently arrived immigrants, and that includes their families. From a start of 56 students when OIHS started in 2007, there are now over 400. They reflect today’s complexity of immigration with 25% being unaccompanied minors, 44% having a gap of two years without attending school and 100% English learners. There are more than 30 languages spoken in the school. ACE Learning Center at OIHS. 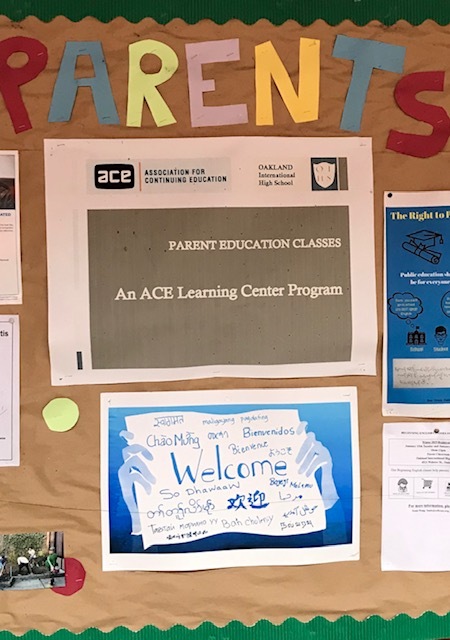 The ACE Learning Center plays a part of English language learning in the community by instructing parents. Trish Malanyaon was the teacher I observed in the class and she led a group of parents in understanding how to talk about “places.” Looking at a picture, these adult students had to identify places like community centers, supermarkets and schools and discuss how places were correctly talked about, other names for them and how they were used. Student Hanna often answered the questions first. But the lesson was also about the use of articles before nouns. The community center. The supermarket. The school. What comes naturally for English speakers didn’t come as naturally for Hanna and the other students. Many languages don’t use articles, so this was new. I get it. I’m a student of the French language. While French uses articles, the nouns are masculine or feminine, and the articles must r, Learning Labeflect that. Le centre sociocultural (masculine.) Le supermarché (masculine.) L’école (feminine.) It’s not easy. Ms. Trish was a firm yet delightful teacher who repeated the lessons in a fun, friendly way. The parent students were learning. Afghan/Pakistan students answer questions during their Community Walk presentation. There were four student-led presentations available, and I attended the Afghan/Pakistan group. 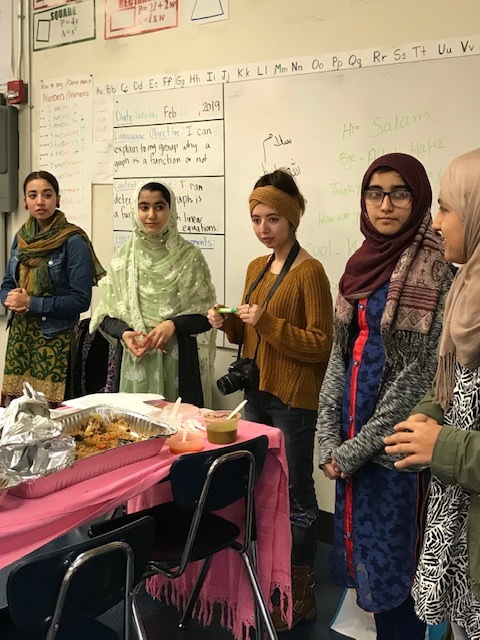 A welcome lunch of sweet rice, a cheesy eggplant casserole and naan bread was served as five 12th grade girls taught us about their countries and how to spell our names in Pashto, an Afghäni language. Written from right to left, I was once again reminded how hard it is to learn a language that is totally different in structure and spelling. And I thought learning algebra was hard. But Sailaja Suresh, one of the founding administrators at OIHS and now Director of its Learning Lab, believes there is a language and construct integration in learning. The Community Walk group asked the students some of their favorite things and I was reminded that young learners are the same around the world. Several of the girls loved to play soccer, while others preferred reading. Favorite books ranged from Romeo and Juliet (both the graphic novel version and original Shakespeare) to Hunger Games. They also loved texting friends and watching movies. They were regular teens. My Community Walk Day was a great blend of visiting the ACE Learning Center and meeting the Afghan and Pakistan students. Education comes in all forms and enthusiasms, and OIHS is using the best practices they have developed to drive learning and excellence. ACE is honored to be a part of the team. In fact, it’s khob. That’s “cool” in Pashto. It would really be khob if I could figure out x in the equation 5(- 3x – 2) – (x – 3) = -4(4x + 5) = 13.